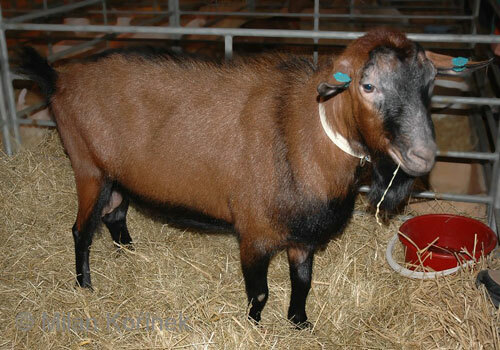 This breed originated with a native breed of un-uniform color, mostly light-brown to white, improved by crossing with German brown (Erzgebirgziege) bucks since the end of 19th century. It was recognized as an autonomous breed in 1954-55. The breed is dispersed in the northern and western mountain regions of the Czech Republic, settled by the German ethnic until 1945. Similar to the German brown in appearance with glossy short hair, cinnamon to ferruginous or darkbrown coat and face. Markedly defined black eelstripe runs from cantle to tailtip. Belly, shank and hoof are black as well. Upright ears. Mostly (75-80%) hornless, with the pollness fixed through systematic selection. Milk and fine in appearance, long legged. Average females weight about 120-140 pounds, height in withers 70-75 cm, heart girth 80-102 cm, males about 140-190 pounds, 75-85cm in withers and 90-110 cm in heart girth. Early mature, first bearing in 12-15 month of age. The population numbers approximately 400 head now with 40% of animals held in 4 newly established commercial flocks. About 200 does included in performance testing (testing system works since 1929) reach 1950 pounds of milk per 300 days lactation (as an average of 1994-1998). The best animals are reaching 2600 pounds, with 3.8% fat and 2.75% protein. The prolificacy is 185 % in average. Quadruplets are rare.